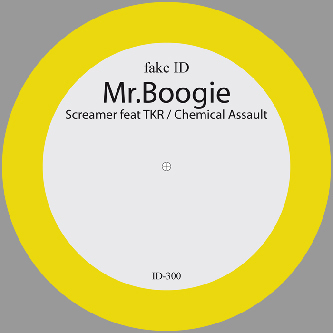 The wicked Fake ID imprint moves from strength to strength with two tracks from Mr Boogie happily ignoring any silly 'step cliches and instead coming with the real heavy stuff. 'Screamer' ft TKR does the mid range rave riff thing in its own style with ruff textured synthlines and a heavy stepping riddim underpinned by reeling bass pressure displaying enough tricks to keep even the hardest-to-please stepper in line. 'Chemical Assault' on the flip cuts into an effective style of hiphop/dancehall inspired by the whole Caspa/Rusko thing and executed to way higher standards than huge swathes of that scene. Mista Boogie's metallic rave-riffs wriggle with an unhinged yet concentrated vibe that doesn't fall into into the hardstep torpor of so much dubstep bait and for that reason comes recommended to all dubstep crew!